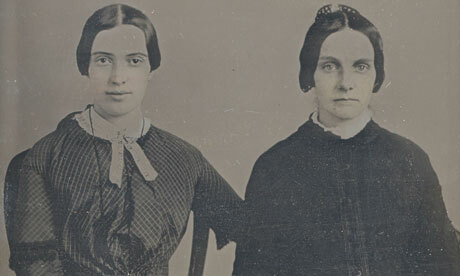 I always had a hunch that Emily Dickinson was a beautiful woman. There was something about the story of the reclusive crazy lady in the attic writing poetry and the wisdom and genius in her poems that just didn’t add up. Now we have some proof (if this photo is indeed of Dickinson). In order to write poems as brilliant as Dickinson’s, you need to experience life. Maybe at some point, she stayed at home more than what was considered usual, but I don’t feel like the story handed down by English professors is accurate. Just look at her (on the left). Most likely, she is about 25 years old in this photograph. Her direct gaze and the arm she affectionately places on her companion clearly show she was caring and self-possessed. And I always had a hunch she was beautiful. The way she wrote about life and love; this woman knew a thing or two. ~ by Valerie Palmer on September 5, 2012. This entry was posted on September 5, 2012 at 9:22 pm and is filed under Uncategorized.You can follow any responses to this entry through the RSS 2.0 feed.You can leave a response, or trackback from your own site.